Powers: None. Kort had access to advanced technology, including a large robot and an atomic-powered ray gun. The robot was powerful enough to destroy entire military and research installations. Its primary ability appeared to be super strength. It may have tunneled under and destroyed the bases by destroying their foundations. It was made out of conventional steel, and it couldn't stand up to a single blow from the Thing. His ray gun apparently emitted radioactive blasts, and a single blast proved able to subdue the Hulk. Kort also possessed sufficient experience and training to at least pose as a doctor equipped to assist the research of Dr. Bruce Banner at a top government research facility. History: Karl Kort was an agent of an unknown communist group. His mission was to destroy US military bases and research installations. He used a large robot to secretly destroy the facilities. Due to the severity of the damage, it was mistakenly believed that only the Hulk could be the saboteur. Kort obtained a job at Desert Base, acting as assistant to Dr. Bruce Banner. While there, he collaborated on and then destroyed Banner's Project 34. 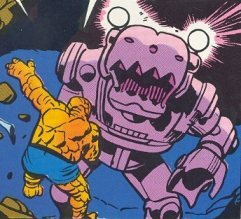 (Fantastic Four I#12) - The Fantastic Four were commissioned by General Ross to bring in the Hulk, whom he believed to be responsible for the destruction of the other US military bases. Kort, nervous, inadvertently dropped his wallet while meeting the Fantastic Four. Rick Jones took Kort's wallet back to him, but saw his communist membeship card. Kort caught Jones and took him hostage. Kort sabotaged a test of a rocket sled, which involved the Thing, but the rest of the group helped the Thing recover without injury. Kort left a message for the Hulk instructing him to drive the Fantastic Four from Desert Base if he wished to see Rick again. Meanwhile, Kort took Rick into an old ghost town, via catacombs below Desert Base. The Fantastic Four discovered the catacombs as well, and investigated them. The Hulk ambushed them, and their struggles brought them into the ghost town. After an inconclusive struggle, a ray blast from below knocked the Hulk unconscious. Ripping open the ground below him, the Thing discovered and destroyed the Wrecker's robot. However, Kort, holding the atomic-powered ray gun that had dropped the Hulk, then took aim at the Thing. The Invisible Girl knocked the weapon from Kort's hands, and the other members apprehended him. Reed Richards cleared the Hulk of any blame with the US military. Thanks to Future for the color images! Kort was a member of a "subversive communist front organization." He even kept the membership card in his wallet. Project 34 seems awfully similar to the device the villainous Dr. Strange used to shield his island from atomic attacks. Could there be a connection? Wrecker has an entry in Marvel Legacy: The 1960s Handbook. Project 34 was designed to emit electromagnetic energy to form a shield to protect US cities from missile attack.